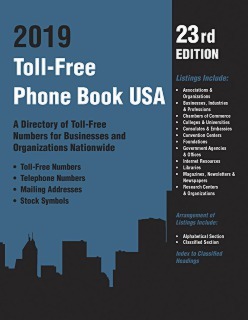 Toll-Free Phone Book USA 2019, 23rd Edition provides verified, accurate and up-to-date toll-free telephone numbers, along with other key contact information, for top companies, organizations, and institutions nationwide. Listings are presented in two easy-to-use sections: an alphabetical section, in which listings are arranged alphabetically by company or organization name; and a classified section, in which listings are arranged under subject headings and subheadings by business or organization type. All of the entries are listed in each section. Each listing in Toll-Free Phone Book USA provides the official name of the company, organization, or institution; street or other mailing address; city, state, and zip code; toll-free telephone number; and local telephone number. For publicly traded companies, stock exchange information is provided as well. Company Names: As a general rule, complete official names are given for companies and organizations. In the case of listings for companies that are clearly named after individuals, information usually is presented both by the person’s first name and by the last name. For example, LL Bean Inc would also be listed as Bean LL Inc. Companies that are well-known by an acronym or initialism—for example, IBM—usually are listed both by acronym and by full name (i.e., “IBM” and “International Business Machines Corp”). Addresses: Most of the addresses provided in this directory are street addresses, unless mail cannot be accepted at a particular location, in which case a post office box or other mailing address is provided. Toll-Free Numbers: All ten digits, including the area code (800, 866, 877, or 888), are given for each listing’s toll-free number. If the toll-free number is intended for a specific use (e.g., customer service, human resources, or technical support) rather than for general calling, an asterisk is printed to the right of the toll-free number and an explanatory note (e.g., *Cust Svc) is printed on the line below the name/address data. Telephone Numbers: Local telephone numbers given in Toll-Free Phone Book USA are usually for the main number of a company or organization, and area codes are included with all phone numbers listed. Stock Exchange Information: Trading symbols and corresponding stock exchanges for publicly traded companies are provided below the company’s name and address. Classification Codes: In addition to contact information, each listing in Toll-Free Phone Book USA contains a classification code. Classification codes appear in both the Classified Section and the Alphabetical Section, thus providing a common element that links the two sections. Users can determine a company’s business activity by matching a number in a “Class” column to the corresponding subject heading number in the Classified Section.